If you want to appliqué on your pocket, do it now. Once that is out of the way, it’s piping time! 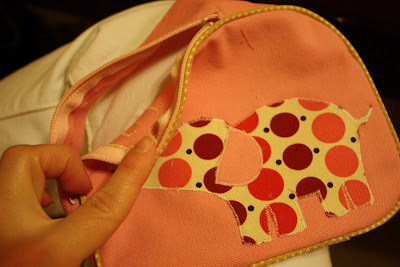 Place your piping along the edge of the pocket front. 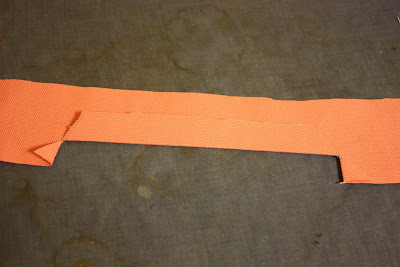 The raw edge of the piping should line up with the raw edge of the pocket. Stitch around until you’re about an inch from your staring point. 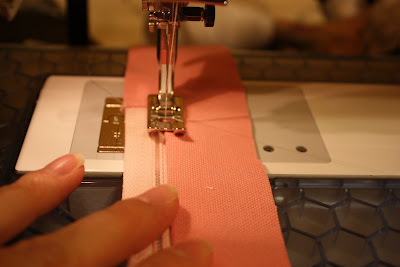 If you have faith in your measuring skills you may have already cut your piping to the appropriate length. I never do that, I do not have such faith in my measuring skills. If you’re like me, snip off the excess piping. 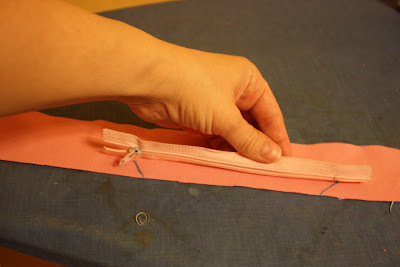 Now, before you started sewing the piping on in the first place, you should have opened the seam that holds it together and snipped out about an inch of the cotton cord. 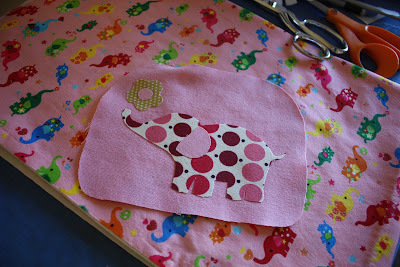 Then, you should have folded the, now empty, end of the bias under about 1/4 inch. Ta da! The pocket front is done! 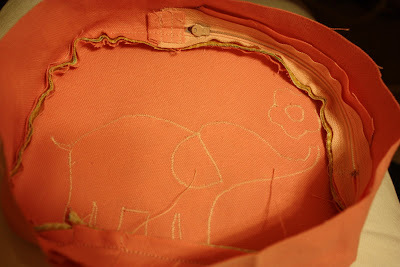 Now it’s time to think about the sides of the pocket, and more importantly, the zipper. 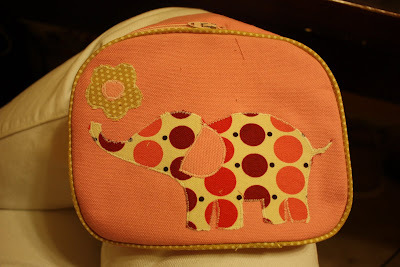 The sides of the pocket are made of a strip of canvas 2″x the measurement (plus seam allowance) of the perimeter of your appliquéd and piped pocket piece. Find the center of your pocket side piece and position your zipper accordingly. 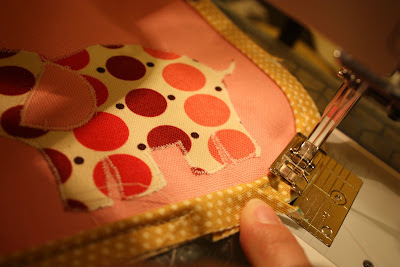 Once you’ve decided where you want the zipper to go, lay it on top of the side piece, flush with the edge of the same. Mark where the zipper begins and ends, and snip diagonally. 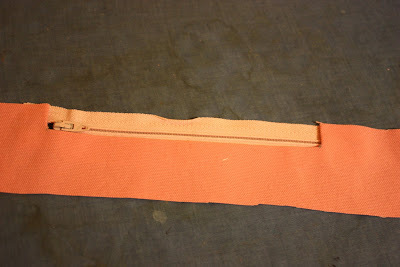 after snipping, press the newly made flaps open to make a little zipper window. The side piece with it’s window should fit over the zipper like this. 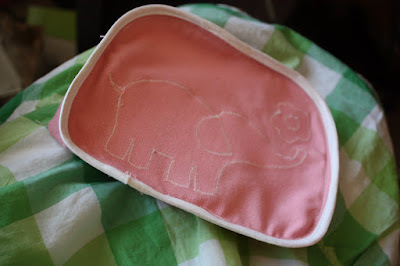 Throw that baby on your machine and top stitch all the way around. 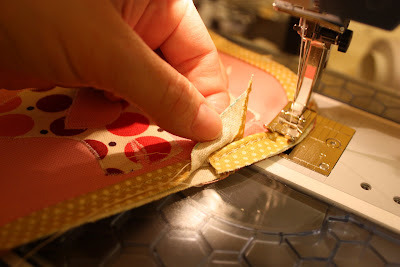 When you’re about halfway along the zipper, stop sewing with your needle down. 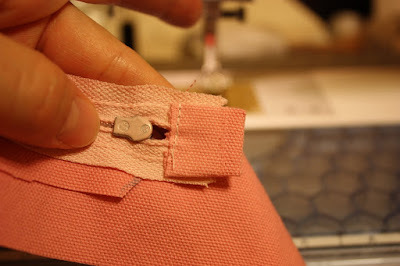 Lift the presser foot and unzip the sipper. 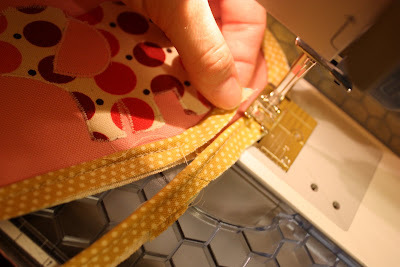 This way the zipper pull is out of the way so you can stitch nice and close to the zip edge without interference from the pull. Oh, I also took a little scrap and tacked the lose ends of my zipper together just to reinforce that point a bit. I did it after my zipper was stitched in because I didn’t think if it before then. And the front side should look like this. Now we’re ready to stitch the pocket front to the sides. This is another step I forgot to take a picture of. Start at the bottom of the pocket. Leaving about 5/8″ unsewn, stitch the side piece/strip along the edge of the front pocket piece with 1/4″ seam allowance. 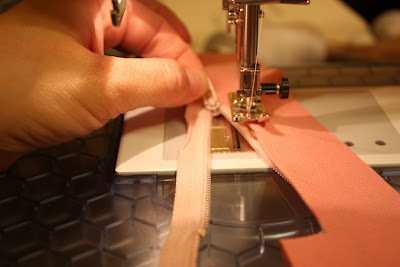 You should be stitching right over the seam you made when you put the piping on. 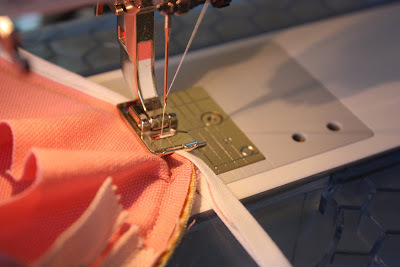 Once you make it back around to where you started, sew the 2 ends of the side piece/strip together. This is why we left that 5/8″ flap when we started. Man, I wish I’d taken a picture of this. Anyway, confusing instructions aside, this is what it will look like inside at this point. I forgot to buy a zipper of the appropriate length for the pocket. Stash to the rescue! I found I had this one that would do but at just 6 inches, it was a little short. It would have been mighty tricky to get a pencil any longer that six inches into that pocket if I’d put that zipper across the straight top of the pocket. 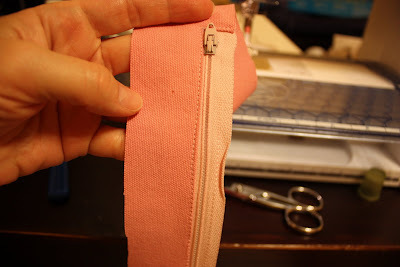 By off setting the zipper to curve around one corner of the pocket, I preserved the ability to utilize the diagonal space within to maneuver supplies. A zipper long enough to curve around both top corners would have been more efficient, but this will work well enough, and I kind of enjoy the effect. Now, you’ll remember that inside our newly formed pocket are a bunch of raw edges. I am not ok with this. I have a strong dislike for raw edges. Also, I want this back pack to last a good long time. If something spills in it and it has to be washed, I don’t want stringy frayed awfulness hiding inside the pockets once it’s clean. The answer? Double fold bias tape. Just wrap it around those raw edges and stitch away to seal up any string globs that may have been lurking in your pockets future. When you’re done it will look like this. Turned right side out, it will look like this. Now our pocket is ready to join the party. See you next time when we’ll assemble this bad boy! 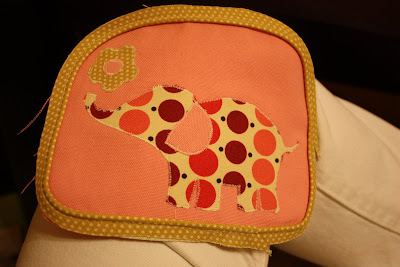 ok so i know nothing about sewing and could not even get close to following this all… but it is super cute and it made me want to learn to sew.. at least for a min! lol..
Do people constantly ask you where you get your stuff, and you get to shock them and tell them YOU made it?